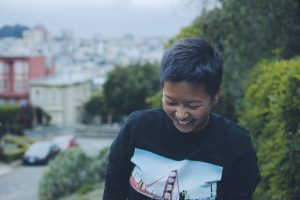 Image Description: Caroline, wearing a black long-sleeved shirt with a picture of the Golden Gate Bridge, smiles while slightly facing the ground. CAROLINE TRUONG has been an active volunteer with APIENC since last year and is part of our Trans Justice Working Group. Most recently, Caroline supported the curriculum development facilitation of our February Trans Justice Training for Trainers and was an awesome co-facilitator for our Trans Hxstories workshop at QACON this past April. Growing up in Chinatown in an SRO to living in Tenderloin’s affordable housing, they felt like they grew up with the understanding of community. Caroline shared, “Community raises you and sees you grow. Community allows for folks from different backgrounds and identities to come together and find common ground.” They are motivated to keep doing what they do because of the trials and triumphs that their grandmother, aunts, and mother have gone through; they have also learned the value of compassion through their matriarchs’ sacrifices and choices. Though there have been times when their elders lived paycheck to paycheck, eating canned fish and plain rice, or just a bun, their elders taught them the example of sharing half or all of what you have. In college, Caroline was involved with the Asian Pacific Student Association and the Cross Cultural Center. Being in these spaces, they learned about intersectionality, anti-blackness, white supremacy, and all the -isms. But most of all, they are forever grateful that they found these spaces because they found community and learned what it meant to be a conspirator. In these spaces, they learned to accept and explore what it means to be Caroline. Post-college, Caroline has been involved with Brown Boi Project and APIENC. In these spaces, they celebrate their trans and queer self and they are happy. Caroline works with APIENC because APIENC has made a space for them in their community. “it is absolutely priceless to work with folx who are passionate and committed to social justice.” In APIENC spaces, they honor the ancestors that have come before them to pave the path ahead of us – and they celebrate the folx still living and fight with everything they got. Caroline’s hopes for the TLGBQIA+ API community are abundant. They hope that folx will be able to grow alongside their chosen family and find their community. They hope that folx will find patience and empathy in their spaces, but also carve time to set boundaries. Fun fact: Caroline really loves dog socks and doesn’t own enough. But it’s because they don’t have a dog so this is all they got.